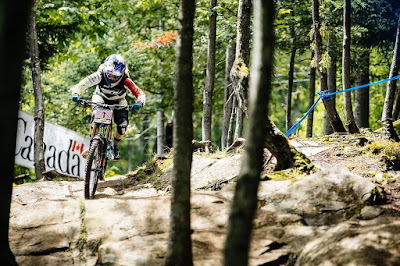 The unstoppable Rachel Atherton took her fourth consecutive World Cup win at Mont-Sainte-Anne this weekend, continuing to demonstrate "the form of her life" and extending her lead in the Series overall. Rachel currently holds 1160 points, 375 points clear of second-ranked Emmeline Ragot (whose season looks likely to be curtailed by elbow and ankle injuries sustained in practice) and 446 points clear of third-placed Manon Carpenter. At today's dramatic Finals race, Myriam Nicole was in the hot seat with 5.07.29, when third-placed qualifier Manon Carpenter came on course and the rain began to fall. The light drizzle was enough to make the rock garden even more treacherous; a mistake cost Manon time, she was down at the first split, but by split two she was faster by 0.7 seconds. Tension mounted as Manon decided not to take the jump in the bottom section (saying later it was just too rutted) but she nevertheless managed to go into the lead by 0.2 seconds. Emmeline Ragot had looked super-fast in practice, qualifying second to Rachel but her practice crash forced her to withdraw from the Finals and most likely the rest of the season. So Rachel was next on course. By now the rain had started to fall in earnest but Rachel said: "I just put the tear-offs on my goggles and tried to ride it like it was dry!” She put in another brilliant run, straight-lining the berm after the big rock drop in a daring move that paid dividends for her - up by over two seconds at the first split. She dabbed a foot in the ultra-slippery woods but was still up 1.8 seconds at the second split, powering down the course to cross the line 3.417 ahead of Carpenter for her 24th World Cup win at the 25th Mont-Sainte-Anne World Cup race! Rachel said: "I'd done the inside line in practice just the once, and i'd seen the boys do it so I just went for it. Mont-Sainte-Anne is a course that has kicked my arse before so I'm extra stoked to take the win here today. That was slippery!" In the Men's, torrential rain had disrupted the Qualification race so plenty of big names were well down the order. The weather continued to cause chaos for Finals with on-off cloud-bursts sweeping the mountain. Taylor had qualified 29th and was unlucky to come on track at the height of the downpour. Taylor said: "It was an ice rink." He ended up off-track losing a lot of time and finished in a disappointing 54th. Aaron Gwin had a DNF in qualis but his protected status meant that he got to race today. He smashed Eddie Masters' time by 4.9 seconds to take the hot seat with about 20 riders still on course. Gee had qualified 18th after a crash. He lost some time in the top-section when he put his foot out in a turn, 2.7 seconds back at split one and generally looking more messy than we would expect from him. 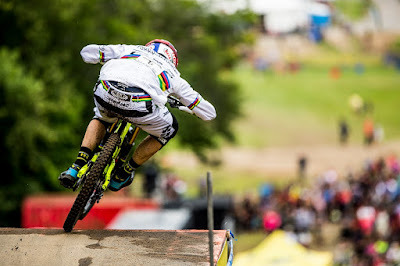 He pulled things back, looking a lot smoother in the mid and bottom sections, crossing the line 2.7 seconds behind Gwin to go into second place. 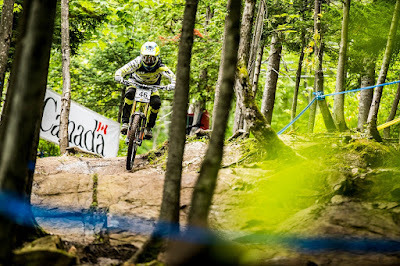 There were still 17 riders left on the mountain and Gee's time would only be fast enough for an eventual 12th place. Gee said: "Not the result I was after today, but at least I stayed on the bike - not something I can always say at this track!" 16th qualifier Loic Bruni did his bit for the "ride it without a chain" brigade when he smashed into a rock on a big right-hander and lost his chain. He kept it smooth and tucked, crossing into the hot seat and holding it until fourth-place qualifier's Josh Bryceland's run - enough for an eventual second with Josh taking the win by just 0.2.